Traditionally people have put pen to paper for signing employment agreements and other business documents, a growth in technology has allowed for this to become modernised and the use of electronic signatures is becoming more popular with businesses as they move into a paperless environment. An electronic signature is defined as "a method used to identify a person and indicate that person’s approval of that information" and while electronic transactions have been around for some time, the Electronic Transaction Act 2002 has now been consolidated into the Contract and Commercial Law Act 2017 (CCLA). Part 4 of the CCLA has modernised the language used in the Electronic Transaction Act 2002 and outlines the legal requirements that must be met when using electronic transactions and electronic signatures. Be appropriate and reliable given the circumstances in which the signature is required. Any alteration made to the electronic signature (or information) made after the time of signing is detectable. 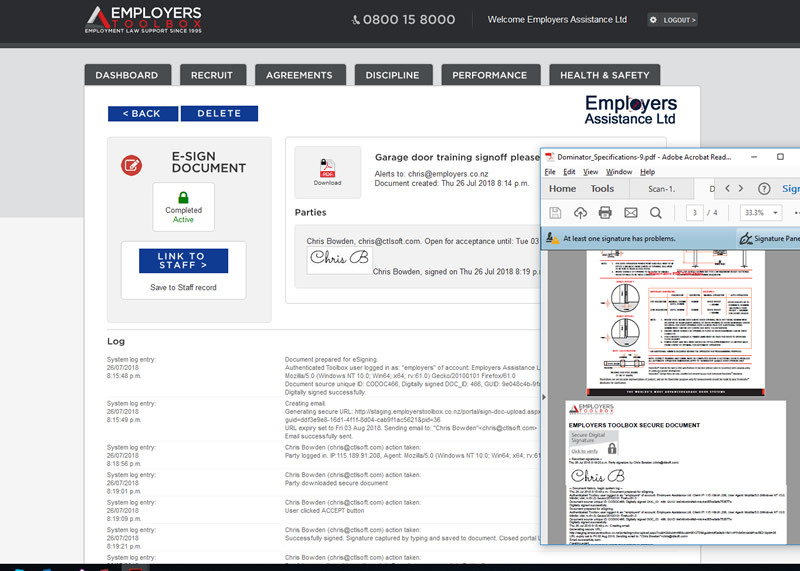 All the required systems to eSign documents is available in the Employers Toolbox cloud based HR platform. This has been introduced to ensure that all the legal requirements are met and you can safely offer the option to electronically sign Employment Agreements and other documents of your choice to job candidates, staff and providers alike. All agreements created within the Toolbox can be automatically eSigned, you can also upload any PDF document for eSigning. Simply specify the parties and emails get sent out offering them the option to eSign through a secure online portal. The entire process is securely managed via the platform. For more information on the Employers Toolbox please click here.